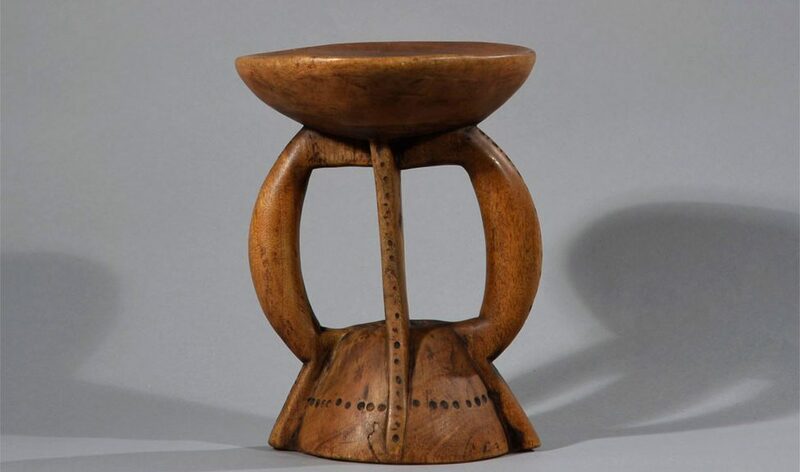 This wooden stool is a characteristic example of an everyday object of the Dinka people, the design being simultaneously inviting and exclusive. The entire carving consists of a single piece of hardwood with neatly carved patterns (also known from the Dinka tribe’s jewelry). This chair is a very personal and prestigious object that the owner carried around, often in a chain or cord. Only men were to restitute on these chairs. The Dinka people is a numerous tribe of cattle breeders in Southern Sudan and is a Nilotic ethnic group native to South Sudan, but also having a sizable diaspora population (around 4.5 million people). They mostly live along the Nile, from Mangalla to Renk, in regions of Bahr el Ghazal, Upper Nile (former two of three Southern Provinces in Sudan) and Abyei Area of the Ngok Dinka in South Sudan. According to oral traditions the Dinka originated from the Gezira in what is now Sudan. In medieval times this region was dominated by the kingdom of Alodia, a Christian multi-ethnic empire dominated by Nubians. [ Living in its Southern periphery and interacting with the Nubians, the Dinka absorbed a sizable amount of the Nubian vocabulary. From the 13th Century, with the disintegration of Alodia, the Dinka began to migrate out of the Gezira, fleeing slave raids and other military conflicts as well as droughts. Dinka are sometimes noted for their height. Roberts and Bainbridge reported the average height of 182.6 cm. Other studies of comparative historical height data and nutrition place the Dinka as the tallest people in the world. Age: Est. first half of the 20th century. Condition: This stool is carved from a single piece of wood. Beautiful old patina. Despite diligent use in a perfect condition. No damage or insect bites. Measure: Seat C: 19½ cm, Height: 26 cm. Provenance: Collected in the 1970s in situ by German anthropologist and private collector Dorothee von Brentano. Literature: Garang de Mabior, John (June 2011). The Undiscovered Stories About Man Behind South Sudanese’ Freedom.